Facebook and Instagram now reveal how much time you spend on both apps. How to know your spending time on scrolling news feed on Facebook, and watching photos on Instagram? Why it is important to know this fact? A week before I study an article related to health which shows that the teenager’s who spend more than 90 minutes time on a social media platform feel more depressed, anxious, and more isolated. In the month of August 2018 facebook release a new tool for measuring time spent on both apps. Now the tool officially rolling to use for the users. From now we all are able to see exactly how much time we spend on the weekly and daily basis also. 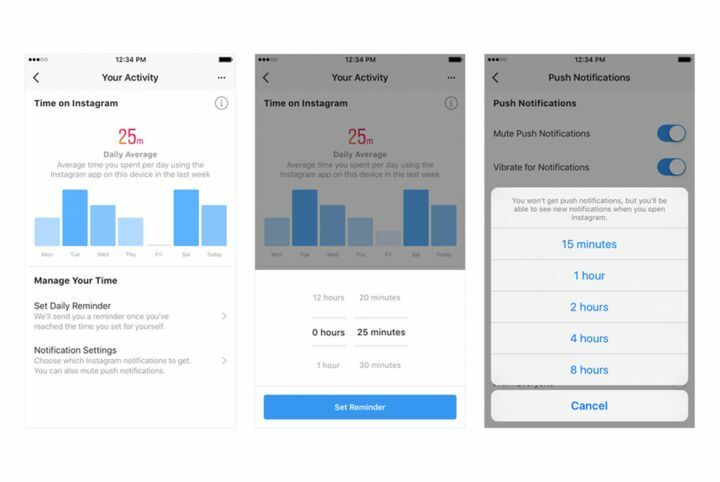 On Instagram, go to setting tap on the activity button there which allows you to know how much time you spending on Instagram. On Facebook, tap on more setting and privacy then click on your time on facebook. Features which includes a new tool of facebook time checker. The director at the research on Facebook David Ginsberg said that “This is all about tools and Insights to aware people to decide themselves what they want to be doing’’. The new feature allows people to view an average weekly time and daytime they spend on both apps. Apart from only viewing time on both apps, you can now set the limit how much time you spend on Facebook and Instagram. The daily remainder features alert you when you cross the time limit which is set by yourself. But if you want to continue simply turn off the notification and use the platform, its plan of Facebook to connect people in a better way in a less time. The company said in one of the statements that it is the duty of the company to help people to understand how time they revel on both platforms so that they manage their experience. Now tool gives more features to control over FB experience. You can now manage friend list told them to show more photos and less news or vice-versa. And on Instagram, you can change the notification setting of receiving like if you not to show notification. In the notification setting, you can mute notification according to your use maximum hour of the mute is 8 hours and also classify which notification you want to receive. Only notification from the people whom you follow or you no notification till eight hours. Facebook is the company which aims to draw the line between time spent and well time spent by using ‘’Time well spent’’ movement a new benchmark set by a company which fruitful for the user. Limitation of the new feature of Facebook time checker. The new time checker facebook tool has many limitations firstly you can not check your time while using Facebook on the desktop, also the feature work only in the app of Facebook and Instagram. It is also not responsible for the total use of Facebook, it means if you use Facebook or Instagram from different devices it only shows how much time you spend in a single device. It is also not for the old user or the person who uninstall the app and still you by using a browser in the mobile as well as desktop. The reason behind launching the new feature. As a bow of ‘’Time spends movement’’ many social media platform admitted that spending hours and hours does not give people joy. CEO of the company Mark Jugberg told in his statement that protecting community from anxiety, depression than to maximize the profit of the company. CEO of the company said that the main goal is to help people for less use of the apps and mobiles. Now it all depends upon you how you define the new feature meaning full to you. There is no way to define the exact time for using the social media platform. nor a tool which shows you for the definite use of time for maximum well being. Director for the center of research on media technology and research said that using social media before sleep at night is cause for the sleep disturbance. He also suggested that to make a balance between helping the user avoid negativity and privacy by less use of social media platforms.